It’s getting very interesting toward the end of the year, and we’ve got the run-down on the best-selling cars November 2011. This month, the make and model at the top of the list is the Toyota Camry, ousting the Honda Accord for top sales accolades. As for the other players, they’ve shifted around a bit. Camry Hybrid) of 23,440 for the month. 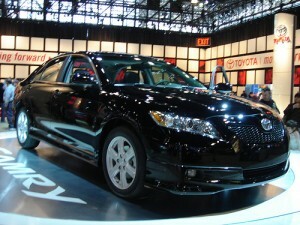 The Camry Hybrid, which arrived in Toyota dealerships in November, has been very well received and is expected to play an even bigger role in overall Camry sales into 2012. For the calendar year through November, Camry and Camry Hybrid sold 275,004 units, down from 296,581 during the same period in 2010. 2. Nissan Altima — The midsize Nissan Altima has gained one place this month to the number two spot with sales of 20,613 units. As for calendar-year-to-date sales, the Altima sedan has sold a total of of 243,005, up 17.8 percent year over year. 3. Honda Civic – The entry-level Honda Civic really made sales inroads during the month, recording sales of 17,133. This boosted the compact Civic from last month’s number seven spot all the way into third place. Through November, the Civic has recorded sales of 200,690 units, which is down 13.8 percent compared to the same period last year. 4. Toyota Corolla – Meanwhile, the compact Toyota Corolla moved up another two spots into the number four spot, from sixth place in October. During November, the Corolla accounted for sales of 16,115. For the calendar year through November, a total of 219,250 Toyota Corollas were sold. That’s down from the 244,024 sold during the same period last year. 5. Hyundai Sonata – Slipping one spot to number five, the midsize Hyundai Sonata reported sales of 15,668 during the month of November. Calendar year-to-date sales this year amounted to 208,621, compared with reported sales of 180,659 during the same time period last year. 6. Toyota Prius – Here’s another surprise: The gas-electric hybrid 2012 Toyota Prius and Prius C are now in sixth place of best selling cars November 2011. That’s due to the 15,208 units sold during the month. So far this calendar year, the Toyota Prius has sold a total of 208,621 units, making it far and away the best-selling hybrid vehicle in the market and good enough to land the Prius among the top ten best-selling cars for November. 7. Honda Accord – There’s no doubt that the biggest shock is the plummet of the Honda Accord midsize sedan from the top spot in sales in October to seventh place for November. During November, the Accord sold 14,355 units. Calendar year-to-date sales through November total 217,958, off 14.2 percent compared with Accord sales during the same period a year ago. 8. Chevrolet Cruze – The compact Chevrolet Cruze, meanwhile, remains in eighth place, the same sales spot it had in October. For the month of November, the Cruze posted sales of 13,238. For the calendar year to-date, the Cruze sedan has sold a total of 215,057 units. 9. Volkswagen Jetta – Volkswagen Jetta sales, including the Volkswagen Jetta SportWagen, totaled 12,891 during November, allowing the Jetta to remain in the number nine sales spot again this month. For the calendar year-to-date, combined Jetta sedan and SportWagen sales totaled 160,937, up 47.8 percent year-over-year. 10. Hyundai Elantra – Hyundai’s other top 10 sales leader is the compact Hyundai Elantra, posting sales of 12,414 units during the month. This is the second month in a row that the Elantra has been in the number ten spot. For the calendar year through November, the Elantra has sold a total of 173,336 units.